We visited the Cave of Pech Merle yesterday, which is famous for its prehistorical paintings of bisons, mammoths, horses, and other animals. Those paintings have been made by people who, according to our guide, were almost identical to us, except, she said, that they were taller than us – on average 1 meter 85 centimeter. Pech Merle has a website that is a bit slow (at least, given my present internet-conditions), but it has a very interesting part where you can enter the cave virtually. Is there still a tree whose roots grow through the cave? For some reason that’s what I remember most about Peichel Merle. 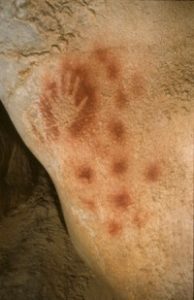 Such handprints are common in cave art. I’ve always assumed they’re the equivalent of “Kilroy was here”. In a pre-literate world there’s no way you can sign your name. But you can make a handprint, thus registering your individual presence. I’m surprised that they allow visitors in the cave; my understanding is that many such sites suffered so much deterioration from the presence of visitors that they are no longer allowed inside. For example, at Lascaux tourists now can only enter a replica of the cave. Dave – yes, the Oak tree is still there and the root still all the way through the cave too! Bob Michaelson – you’re right, I believe Pech Merle is also one of the very few (perhaps the only remaining?) cave were visitors are allowed in. With very strict time limits per visit, and obviously also very restricted visitor numbers. Lights are switched off after every painting has been shown. The guide also told us that the conditions in the cave are constantly monitored, for conservation reasons. I asked her about how exactly the visitors can contribute to harming the cave, and she said the heath of human bodies and the lightening on the paintings are the issues of concern. Why is there a presumption that the black handprints were done by men and the red one by a woman? Is it just size? Just curious about the analysis. The hand is good, the animals are good, the hand next to the animals is best. J. Bogart – someone asked this question to the guide, who said that it can be deduced from the shape of the hand – the size of the hand, but also the relative length of different fingers, apparently. But I assume this must all be probabilistic, and hence the caution with which these statements are made. Not the only one; at least the Font-de-Gaume, near Les Eyzies-de-Tayac, can also be toured. No hands, but still deeply touching art. Thank you for this. Another reminder that the desire for self-expression and art has been a constant in human history. Doesn’t compare with being at such a place, but there’s always Werner Herzog’s documentary about the Chauvet cave; that’s the one with the amazing horses (and lions and rhinos….) drawn thirty thousand years ago. I visited the Lascaux 3 exhibition and was really impressed. The advantage of the museum is one can (often) just sit and absorb the experience of the spaces. Highly recommended. Be sure to stay right to the end. There are some great shots among the credits.